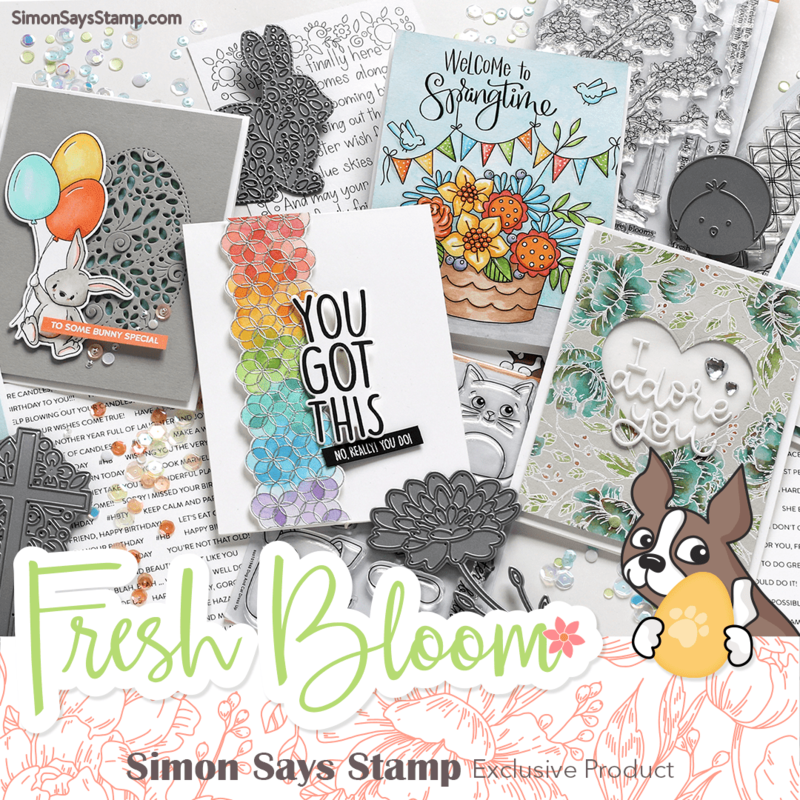 Dashing by with a quick post to make sure you know that there's a great sale going on this weekend at the Simon Says Stamp Store! 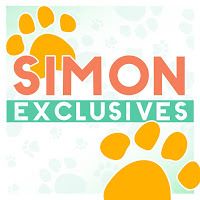 If you've had some Simon goodies on your wishlist, now's the time to grab them! 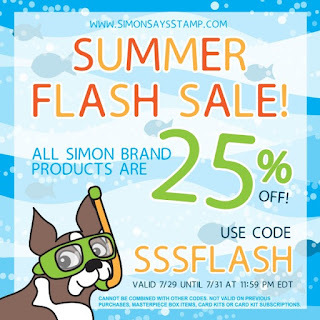 Use code SSSFLASH to get 25% off all Simon Brand products. They can be found HERE. Happy shopping! Since it's the end of the month, it's our traditional "Anything Goes" this week; the design team are playing with Lawn Fawn products, and if you have any, we'd love to see you use them, too. To make my card, I die-cut 6 maple leaves and set them aside. Then I used the negative image of that leaf to "stencil" it across my card front using distress inks. I also used watered-down distress inks to splatter some of the same colors on my card. Then I sponged color on my die-cut leaves. These were affixed to a vellum stitched rectangle panel, along with my sentiments, and then that vellum panel was lifted above my card base with foam squares. I'm here today with a card I made using Simon's latest Card Kit, Seeing Stars. 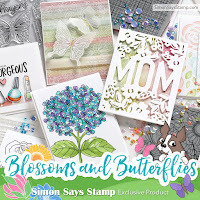 It is packed with so many fun items: besides the usual stamp set and papers, there are a die, a stencil, and 2 mini distress inks!! Everything you see except the striped twine is in the kit. I used the Vented Star die, Seeing Stars clear stamp set, and the inks, cardstock, and the woodgrain dp that was part of the kit. The twine is a Lawn Fawn coral one. Though this seems to be themed for 4th of July and other patriotic events, I hope I've shown that, with this sweet sentiment, it can be used for other occasions, too, especially for making cards for our servicemen. I'm excited to play next with the Motif Resist papers in this kit, and the Fireworks stencil! Don't wait too long if you'd like this one - I'm betting it will be another sell-out! I stamped and die-cut my flamingo, and sentiment first. Next, starting with a watercolor panel, I stamped various leaves across it, then spritzed it with water to make the colors blend, then went back in selectively with the palm stamp and restamped for a bit more dimension. I also splattered some distress ink. That panel was then dried, trimmed, and edged with turquoise before affixing it to my white card base. Then I just added my gorgeous flamingo and sentiment, popping up the flamingo with some adhesive foam that I die-cut. Hope you're keeping cool - thanks for stopping by! Our theme this week is "Things with Wings"! 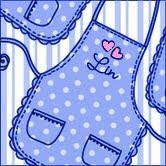 The Design Team are using Doodlebug Designs products, a company that I love! 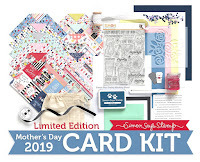 I have oodles of their products - love their 6" paper pads, which have miniature patterns, perfect for card making, and I am a big fan of their washi tape and enamel dots, which they call sprinkles. I'm choosing butterflies as my "winged thing" this week, and I made 3 cards for you! And finally, for my last card, I used papers from a Doodlebug winter collection, Polar Pals, and paper-pieced my butterfly. Love this cool plaid! Another card using this lovely flower - I needed a sympathy card, and I tried to think of the most soothing colors for it - I decided on blues and greens. After I had finished the flower and leaves, I looked for some distress inks in the same shades, and did a smooshed background with them. Inspired by Donna - yet again! While we're on the subject of "tag", I think I'll share a silly video from one of my favorite old TV series, Perfect Strangers, where Balki and cousin Larry play Boochi Tag - it always gives me the giggles - hope it will do the same for you! 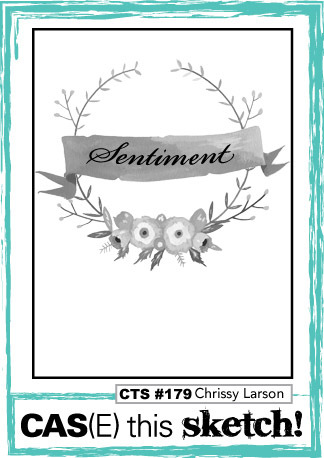 Taylored Expressions has posted its current Share Joy challenge, and when I saw one of the options was CAS, I jumped in! 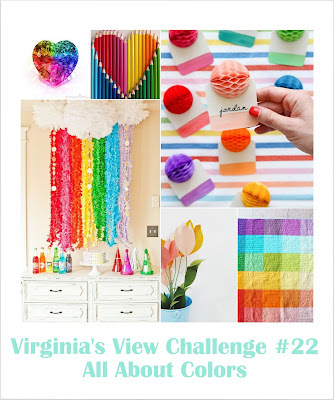 I'd also like to enter this into Virginia's View "All About Color" challenge! Happy Weekend! Thanks for coming by! I recently treated myself to a couple of PTI quilt stamp and dies sets. I no longer make quilts, but I am still in love with them, and stamping a paper one is the next best thing! First up is the spring set, a wedding ring design. Here's the summer version of these quilt patterns, a pinwheel design. This time I used mainly the die and some pretty papers and paper-pieced my quilt block. Before we get started today, I just wanted to send out a huge thank you to all of you who took the time to comment on my last post. I so enjoyed reading them! Hello! This week our theme is "Create a Scene", and the team are all playing with products from Newton's Nook. Having grown up with dachshunds, I thought I'd play with their Delightful Doxies clear set. I don't do well coloring large areas, so I decided to make my scene by paper-piecing. The dogs and balloons were stamped on colored cardstock, cut-out, and then popped above the background elements. As you can see, I stamped the dogs on the background first so that I didn't have to cut out the teensy balloon strings. And here's a little clue to something BIG on the way in just 2 days: a collection of the industry's finest! 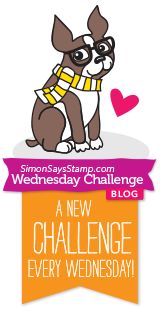 Welcome to a blog hop as part of Kathy's 30 Day Coloring Challenge! Kathy loves to color, and she is hosting her FIFTH coloring challenge! The premise of the challenge is to color something every day, even if it's for five minutes - it doesn't matter what you color or what medium you use. From 2009 - 2012, Hero Arts put together classes of 4 to 8 "Hero Hostesses" for a 4-month term. Our job was to make people feel welcome in the Hero Arts Flickr group, and to contribute our work using Hero Arts stamps. There ended up being 36 of us before the program was discontinued, and as we were a kind of crafting sorority, Kathy was the one who coined "sista" as the name we called each other. We have had loads of fun together, meeting up in real life many times. I treasure each of these ladies, and have a soft spot in my heart for each of them and Hero Arts. Fast forward to 2016. Kathy has asked us, along with some special guests, to participate in a blog hop for her current Coloring Challenge. And Hero Arts has generously contributed TWO $25.00 shopping sprees, chosen from all those who comment!! You should have come from my friend Virginia Lu's blog, Yes, Virginia. 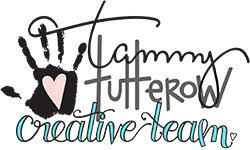 If you are just happening across my blog today, and want to see the blog hop order, you can start at Kathy's blog, The Daily Marker. I've been hoarding this pretty plaid, but this occasion is a special one, so I pulled the colors from it to color my stamped panel, and my medium of choice was alcohol markers. Hero Arts is giving away TWO $25.00 shopping sprees, randomly selected from the blog comments along the hop. You have a week to comment, until July 18, at 12:00 midnight, and the winners will be announced July 19 on Kathy's blog. 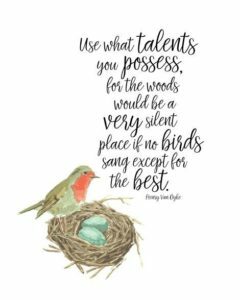 Now, hop on over to Kathy Wade's blog, Wading in Creativity. Enjoy, and we hope that you'll play along in Kathy's Coloring challenge, too! Feel free to jump in anytime from now until August 5 - everyone is welcome! You don't even have to make a card, just do some coloring and have fun with it! I have 2 more birthday cards to share today. To make my background, I smooshed my mini inks all over an acrylic block about the same size as my Bristol paper, then spritzed it a bit, and "stamped" it on my paper, letting it sit a bit to allow the inks to spread. After I was sure that was dry, I overstamped the birthday hat and sentiment several times using my Mini Misti to get a good dark impression. Since July's birthstone is the ruby, I went with that color for my next card, for a special lady. Before I go, have you seen this teaser yet? 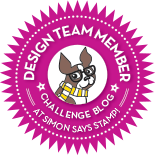 It is SO Top Secret, that even the Simon DT teams don't know anything about it! 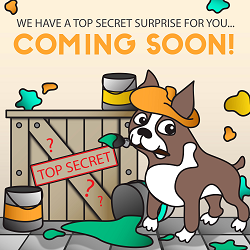 Stay tuned - all will be revealed on July 15! Here's another card using MFT's Flashy Florals stamps and dies; I can't seem to stop playing with them! I think the black and white dots make everything look crisp! 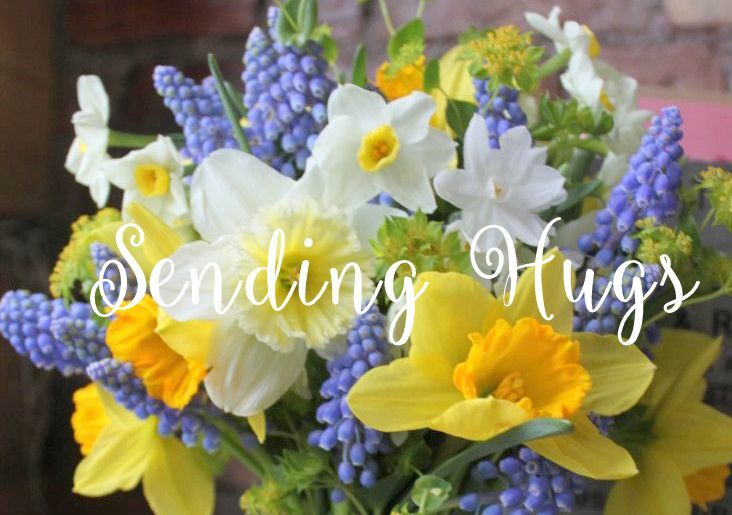 Thanks for stopping by today - have a fantastic weekend! 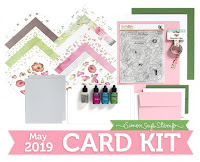 We have a fun challenge this week - our own Jenn has made us an inspiration board, and we'd like to see what kinds of cards you make using the colors and/or the pictures as your inspiration! The DT are using exclusive Simon products this week. I used the stencil, along with peacock feathers and pine needles inks to make my water, masking the top part of the panel. After removing the stencil and masking the stencilled area on my panel, I used a die-cut circle to mask my sun, and sponged on the yellows and broken china inks. Separately, I stamped, colored, and fussy-cut the sail boats, and then attached them to the finished card. I stamped the woodgrain in dark grey ink, then turned my panel over and scored some lines to make planking. Flipped it back over to the front, and used distress inks to shade the planks, following Jenn's colors as best I could, and using a gel pen to mimic waves. The panel was affixed to a white card, and then I added the rest of the elements. Yesterday, my friend Heather issued a challenge to make a "Cozy Christmas Quilt", and I was so inspired by her amazing examples that I got right to it, and used her colors, too. Lil Inker's cover plate and matching die set is always fun to play with: you just die-cut the stitched design, then use the stamps to fill it in as you like - there are a million variations! I used the lightest (lime) ink from the Ombre pad for my diamonds, and the darkest (forever green) for some of my crescents. 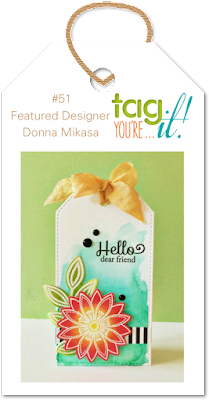 Be sure to visit Heather's blog, Stamping and Stitching, to see what she did - and prepare to be amazed! This was really hard for me to leave this alone......I fought not to add a small colored frame around the inner rectangle, or add splatters or sequins. For me, this is CAS to the max......lots of white space! Here's the sketch - isn't it cute? I'm having another play with Taylored Expressions Rosy Posy embossing folder - this time with distress inks. If you'd like to see this folder used the "normal" way, HERE's another card.